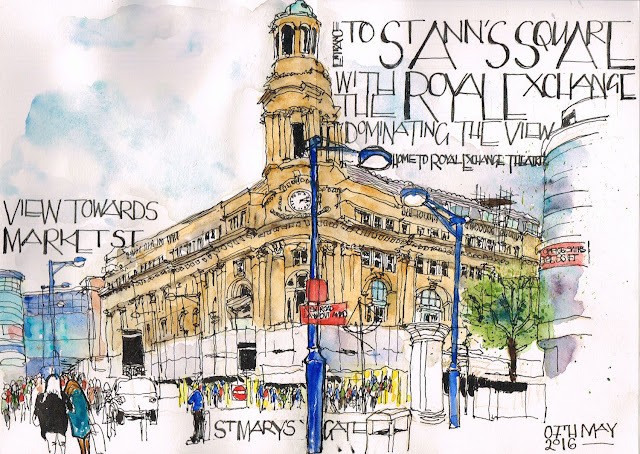 [By Liz Ackerley] On we go with the countdown to the USk International Symposium here in Manchester, this is week 6 (11 weeks until the start of the symposium)) of my City Centre Manchester sketches. Here is this week's sketch: #StMary'sGate looking towards Royal Exchange and St Ann's Square as well as up Market street towards the side of the Arndale shopping centre. The weather is now amazing-sunny and warm so lets hope it lasts until July! St Mary's gate links Deansgate and Corporation Street/Cross Street. 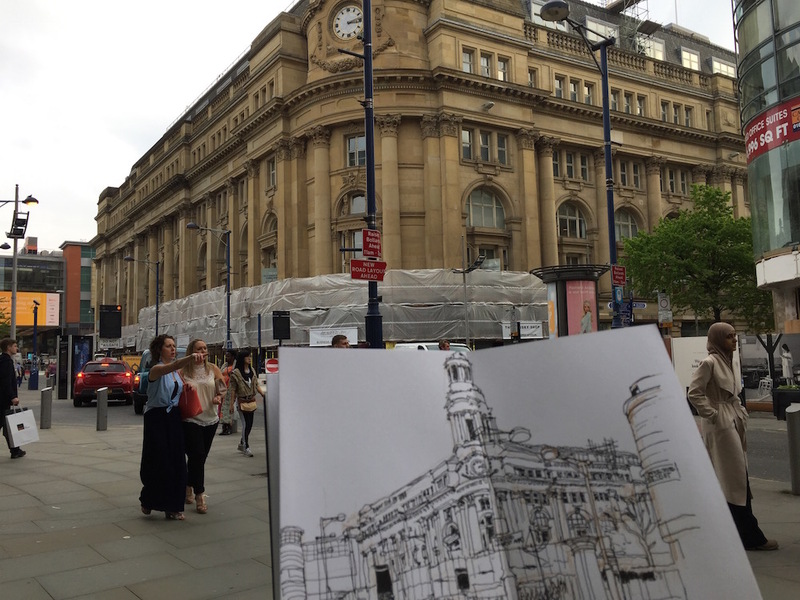 The dominant building in this sketch is the Royal Exchange, a grade II listed classical style building completed in 1921. The complex includes the Royal Exchange Theatre. The Royal Exchange was heavily damaged in the Manchester Blitz and in the 1996 Manchester bombing. The current building is the last of several buildings on the site used primarily for cotton and textile exchange. As you can see, part of the building is now covered in sheeting and scaffolding. Manchester on a Saturday afternoon is very busy and you can see the crowds, in fact, even though I was standing close to the edge of the pavement, with my back to a building, I didn't feel that safe-people are clearly not supposed to stay still and draw when there is shopping to be done!